Our cuddly Alligator will swamp you with affection! 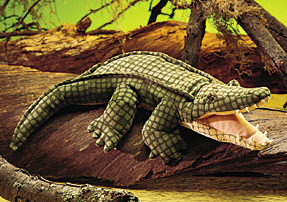 This realistically rendered puppet, with his silk-screened velour and velveteen body and soft plastic teeth, crouches at the riverbank ready to make a splash in your home! Measures 24" long x 13" wide.